JetSeal is the durable paint protection sealant formulated to protect exterior vehicle parts from harsh elements. Chemical Guys blended JetSeal for the aerospace industry with nano-tech polymers that provide the highest levels of protection through extreme hot, cold, wet, and dry conditions. Once product specialists applied JetSeal to automobiles, they quickly discovered how well it protects and enhances any car, truck, motorcycle, SUV, and RV for months on end. JetSeal bonds to the surface and helps repel water spots, industrial fallout and pollution contamination, road grime, solar rays, and residues from birds, bugs, and other road-borne hazards. The UV rejection properties of JetSeal protect paintwork against fading and discoloration, and protect with a brilliant high gloss shine on any paint finish. Spread JetSeal over any glossy and shiny paintwork, polished metals, and clear glass and optical plastic surfaces on the exterior of any vehicle. 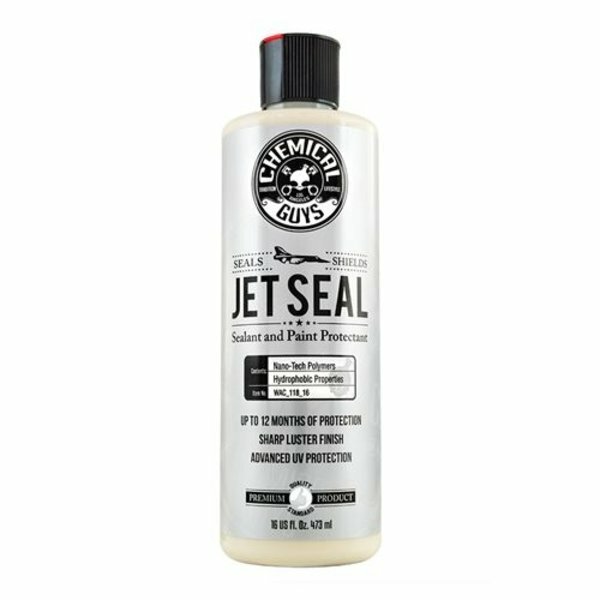 Chemical Guys reformulated JetSeal for extended durability, easier spreadability, and enhanced shine and gloss. Preserve and protect the beautiful finish and clarity of paintwork, glass, headlights and tail lights, chrome, aluminum, carbon fiber, fiberglass, and glossy decals with Chemical Guys JetSeal. Chemical Guys spent years of extensive research and development in the aerospace sector to take protective sealant coatings to new heights. JetSeal uses cross-linking acrylic polymer technology combined with the latest in aerospace nanoscience to block out contaminants at the molecular level. Under a microscope, glossy paintwork is porous and full of uneven ridges, peaks, and valleys. When a vehicle is outside and exposed to the elements, pollution, industrial fallout, and natural contamination get stuck in these microscopic pores and ridges. Over time, these contaminants stain, damage, and oxidize paintwork and glossy surfaces, turning them dull and compromising their integrity. The detailing clay bar removes these contaminants gently, but coating the surface to “fill in” the peaks and valleys leaves no place for contamination to stick to in the first place. Carnauba wax has filled this role for over 100 years, but modern synthetic sealants fill in the spaces at a much finer level for a stronger and longer-lasting physical bond. The protection polymers in JetSeal use microscopic particle sizes for a strong physical bond to paint and other glossy surfaces. Once JetSeal is on the surface, nothing else can stick to it, so contaminants simply slide off or wash away easily. JetSeal is also blended with sunblocking agents to repel harmful UV rays that fade and damage paint and other sensitive materials. Protect, maintain, and enhance any vehicle with the durable protection of JetSeal. JetSeal is engineered for ultimate versatility. The easy-to-use formula can be applied by hand or dual action polishing machine to any vehicle. The innovative sealant enhances paintwork to with a high gloss shine. Simply apply JetSeal for up to 12 months of protection against UV solar rays, discoloration, contamination, and water spots. Protect and enhance any car, truck, motorcycle, RV, or airplane. JetSeal creates a super hydrophobic protective layer that repels water and stains for a brilliant shine. Designed using aerospace technology, JetSeal brings vehicle protection into the 21st century. Take vehicle protection to the next level with Chemical Guys JetSeal. We reached out to detailing professionals and enthusiasts around the world to test the all new JetSeal in the harshest climates. The results lived up to the chemists ' expectations: JetSeal protects and shines in the hottest and coldest climates all over the planet. The secret to JetSeal 's amazing protection characteristics is the highly-refined synthetic nano-tech polymers that bond directly to the surface for long-term durability. JetSeal creates a super hydrophobic shield that pushes away water molecules, keeping the surface free of stains and contamination. With a coat of JetSeal, vehicles have more shine for longer periods of time with protection against more types of contamination. 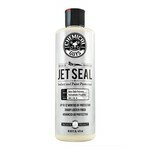 JetSeal protects and shines any car, truck, motorcycle, RV, or airplane. JetSeal is designed to create a high gloss shine that enhances all color paintworks. Apply JetSeal to windows for crystal clear vision while driving in the rain. Spread a coat over headlights and tail lights to prevent yellowing and fading from harsh UV sunlight. The advanced JetSeal Paint Protectant is formulated to protect any vehicle during the hottest summers, and the coldest winters. Drooling, which I managed to keep under control, lol! Inspect airplane for dirt, grease, bugs, and fallout. The plane was in great condition and required no polishing. Degreased landing gear, between wings, and belly with Grime Reaper. Chemical Guys EcoSmart waterless detail with pod to remove dirt, bugs, and very minimal fallout. Clay wipe small portions of the plane. Porter Cable DA with 5.5 black hex logic pad. 2 heavenly coats of Jetseal. CG Yellow/Black ribbed microfiber towels. Thank you CG, Garrett StephensXtreme Mobile Detailing"Your Place Or Mine, I'll Make It Shine"
JetSeal is available in 4 ounce, 16 ounce, and 1 gallon sizes. Squeeze 1 - 3 lines of JetSeal onto a premium foam or microfiber applicator pad and spread over painted panels, glass, polished metals, and clear plastics in a thin, even coat. Place 4 - 6 dots of JetSeal over foam pad, then spread evenly over paintwork, glass, polished metals, and clear plastics between speed settings 1 and 3.